Raised to walk in new life. Where I worship, we almost always sing “We Love You With the Love of the Lord” after a baptism. 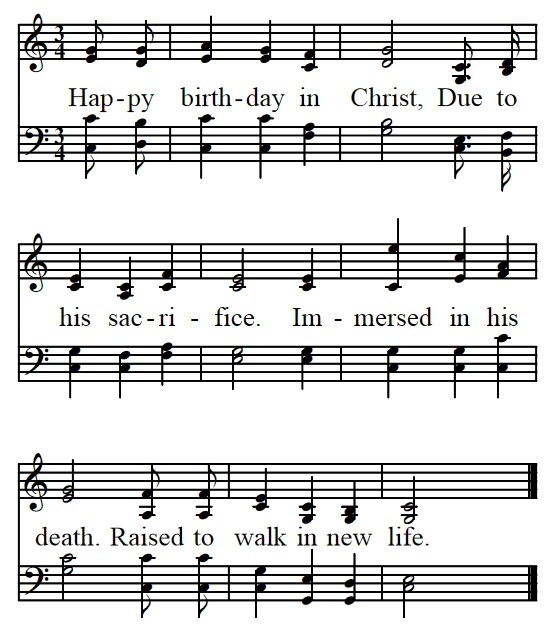 I learned recently that We Care Ministries sings “Happy Birthday” to the new brother/sister in Christ. I wrote this as an appropriate alternative. If the melody sounds somewhat familiar, that is because the tune could be called “Variations on a Theme Called Happy Birthday.” It is based on the familiar tune used at most birthdays in the United States.